Two weeks ago, I posted that I had started swimming again, after about twenty years. I’ve now entered my third week of swimming, and am still absolutely loving it, and looking forward to every session. I’m feeling happy that I’ve improved, if only slightly. At the moment, I’m just trying to set down a base for swim fitness, not being at all concerned about speed. That will come later. In week 1, I did 4 swim sessions. For three of those sessions, I followed the Speedo Australia program for those starting out, or getting back into swimming. The other session was just lap swimming at a fairly slow even pace. My main aim at the moment is to increase the number of laps swum without needing a rest. Week 2 was much the same, with three sessions following the program, and one session of lap swimming. I’m looking forward to moving on to the Level 2 Improver Program. I feel as though I’m ready for it, as I’m finding the beginner program to be quite easy and much too short. The sessions for the swim program are only 20 minutes. Even in the first session, I felt that wasn’t enough for me, so I’ve been doing 45 minute sessions. The extra time in each session has been focusing on lap swimming and improving my technique, which is definitely not what it was previously and needs serious improvement. The aids are really helping with my technique. As well as helping to improve stamina and muscle tone, swimming is also a great cardiovascular activity and the perfect choice for an all-over body workout. 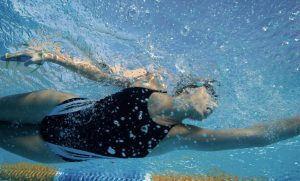 Regular swimming will improved fitness, while virtually eliminating impact on joints and muscles. To finish up each session, I’ve been doing a few laps of walking in the water, which is really good for my old dodgy knees.